The most common form of acupuncture, where the acupuncturist takes a full medical history, and asks questions about your health issues. Following diagnosis, needles are placed at different points around the body and left for 30-40 minutes. First appointment: an additional £10 for diagnosis which takes a further 30 minutes. Cost: £55 for 45 minutes, £65 for 1 hour. A wonderful, toxin free alternative to invasive surgical treatments, cosmetic acupuncture is a very effective way of promoting collagen, reducing lines, toning and enhancing facial contours. This is combined with a relaxing facial rejuvenation massage. 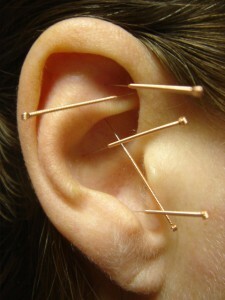 Clients can be treated with auricular acupuncture in a seated position, while points around the ear are needled. This ‘microsystem’ can treat any condition but is particularly helpful for stress, weight-loss, smoking cessation, PTSD, alcohol and drug addiction. A protocol of just 5 tiny needles take a minute to put in and stay for half an hour, making it an ideal treatment for busy people. You stay clothed and seated throughout and relax while the needles do their work. Cost: £45 for 40 mins. Two people £80 for 40 mins. Scalp acupuncture is renowned for treating neurological and conditions including stroke, multiple sclerosis and spinal cord injury. However, this micro system can also be used for many other conditions including Depression, Parkinsons, Alzheimers, and diseases affecting speech and motor skills. The unfortunate reality of acupuncture accessibility for stroke victims in the U.S. is movingly documented in the film 9000 Needles. Kevin Dearth received scalp acupuncture as part of his participation in an integrated stroke-rehabilitation program in China. He went there to receive treatment because a comparable level of care was unattainable in the U.S.
Acupuncture has been found to aid fertility as a stand-alone or alongside IVF. A number of recent studies focus on how reproductive acupuncture helps fertility and improves IVF success rates. Acupuncture can also support women in pregnancy, particularly with symptoms such as morning sickness and heart burn. The use of Moxibustion to turn a breech baby is well documented. TuiNa is a dynamic form of massage based on the same principles as acupuncture and clients often feel energised and invigorated after a treatment. TuiNa is a strong, therapeutic massage used to treat a variety of health issues as well as being very effective for musculo-skeletal conditions and injuries such as back pain and tension, whiplash, sciatica and frozen shoulder. It is delivered as a stand-alone treatment or to complement acupuncture. A dynamic and deeply relaxing form of Thai Massage performed by a true professional, with years of experience. This massage is strong but not painful. It’s effective for all kinds of musculo-skeletal issues, aches and pains or simply some TLC for stress and overwork. An ancient Northern Thai energetic and vibrational musculo-skeletal therapy using a wooden hammer and peg that the practitioner uses to gently tap over the body. Although unusual, it’s highly effective at reducing pain and increasing mobility, and extremely relaxing. As a qualified swimming teacher and lifelong swimmer, Rita uses the medium of water to help clients improve their technique, reduce their fear and relax the body. If a client has musculo-skeletal problems or suffers from stress and anxiety, swimming without putting strain on the body is a great way to reduce aches and pains and reduce tension. Rita’s approach uses eclectic teaching methods to help clients to move fluidly through the water. PLEASE NOTE A CANCELLATION FEE FOR THE FULL AMOUNT WILL APPLY IF LESS THAN 24 HOURS NOTICE IS GIVEN.